Photographer sues Warner Bros., Bravo owner NBC Universal and decorator Martyn Lawrence Bullard for allegedly blowing up a photo and using it on the show without permission. We have a soft spot for lawsuits that set-up allegations this way: "For the first time in history..."
Usually, it's hyperbole, but it's hard to believe there's ever been a lawsuit quite like the latest from photographer Michael Eastman,. 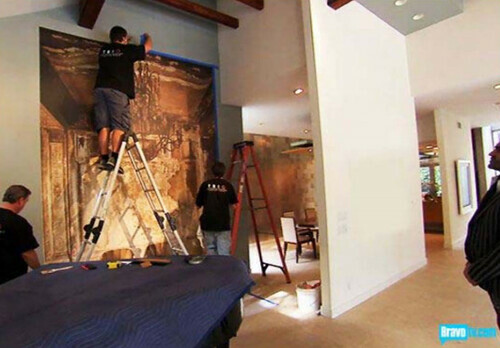 Eastman charges that when Bravo Network's reality series Million Dollar Decorators introduced its "pièce de résistance" in episode 5, it committed copyright infringement by taking one of his famed photographs and BLOWING IT UP REALLY LARGE. All with the aide of some very special equipment from Warner Bros. According to Eastman, he was approached by co-defendant Martyn Lawrence Bullard, an interior decorator whose celebrity clients include Elton John, Cher, Aaron Sorkin, and Kid Rock, and whose work is featured on Million Dollar Decorators. Bullard wanted permission to decorate the living room of model/actress Daisy Fuentes with one of Eastman's photographs entitled "Isabella Two Chairs, 1999." Eastman was fine with it at the time and asked Bullard if he wanted a new color version. Bullard responded he already had what he needed, and Eastman assumed that the show would only feature a smaller black-and-white version of the limited edition work. Eastman signed a Clearance Agreement so that his licensed material could be used as background in Fuentes' home and shown on TV. Then, Eastman got a big BIG BIG shock. Bullard allegedly found a color photograph, presumably on the Internet, took it to Warner Bros. in Burbank, California, where reps from the studio, according to the complaint, "proudly describe(d) their special image-enlargement machine." Warners' equipment was then used to massively enlarge the small downloaded image into an enormous 15 feet tall and 8 feet wide reproduction of Eastman's work, according to the complaint. The enlarged photo (below) was then placed in Fuentes' living room and, the complaint continues, "Mr. Bullard ushers Ms. Fuentes around the corner to show her what he describes as the “pièce de résistance” -- which Eastman thinks is of lower resolution and quality than his original work. Besides the alleged artistic degradation of his photograph of two chairs, Eastman takes objection to the fact that he wasn't credited in the episode as the artist behind the actual photograph. Eastman is now suing NBC Universal, Warner Bros., Bullard, Bravo Media, and Goodbye Pictures for copyright infringement, violation of the Visual Artists Act of 1990, fraud, rescission and breach of contract. He's demanding at least $75,000 in damages and a restraining order against the re-airing of the episode.